Order Beside Still Waters now! Copies are $18 and there is a discount available for bulk orders of 10 or more. I edited Beside Still Waters as the first publication project of Bayit: Your Jewish Home, and we co-published the book with Ben Yehuda Press. It’s a bilingual volume to support the journey of healing, loss, grief, comfort and renewal in both individual and communal contexts. Beside Still Waters offers materials for before death, stages of mourning and grief, remembrance and much more. Beside Still Waters is a curated volume with traditional and modern liturgies, resonant new translations, evocative poetry and readings, and full transliteration. It also offers prayers for a variety of spiritually difficult circumstances (miscarriage, stillbirth, suicide, when there is no grave to visit, mourning an abusive relationship) too often overlooked in the journey of memory and transformation. 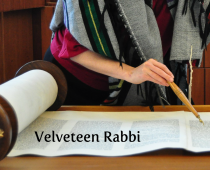 It features the work of some 40 contributors from across the breadth of Jewish life.